Geneva (Switzerland) – December 1, 2016 (travelindex.com) – Increased integration into the global economy of the economies that comprise the Association of Southeast Asian Nations (ASEAN) has made the region a more accessible market for trading goods than either the European Union or United States. This is one of the findings of the Global Enabling Trade Report 2016, published today by the World Economic Forum and the Global Alliance for Trade Facilitation. The report features the Enabling Trade Index (ETI), which assesses the performance of 136 economies on domestic and foreign market access; border administration; transport and digital infrastructure; transport services; and operating environment. Produced every two years, the report is a benchmark for leaders looking to boost growth and development through trade. 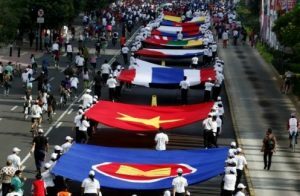 ASEAN’s progress as an economic power comes at a time when the United States and European Union are becoming less open, according to the report. However, ASEAN’s progress in other areas measured by the index is less pronounced. As a result, the best economies for enabling trade tend to be in Northern and Western Europe, with the notable exception of Singapore and Hong Kong SAR, in first and third places, respectively. Another key finding of the report is the limited success with which governments are tackling border administration efficiency. Reforming administration is recognized as a “low-hanging fruit” capable of producing disproportionate gains for both small and large businesses compared to the financial and political capital required to implement them. This lack of momentum could be seen as a cause for concern as the World Trade Organization’s 2014 Trade Facilitation Agreement comes into force in 2017. A further finding of the report is that, despite popular perceptions, large swathes of the global population are still unable to participate in international trade or global value chains. Larger emerging markets in particular fare poorly in the ETI, with China representing the only top-10 most-populous nation in the top half of the index. Six others, home to 2.4 billion people, rank beyond the 100th mark – India (102nd), Brazil (110th), Russia (111th), Pakistan (122nd), Bangladesh (123rd), and Nigeria (127th). Europe and North America remain the highest performing regions on enabling trade, although both have witnessed a slowdown in integration since 2014. Most improvements in Europe have been among the newer EU entrants, (Lithuania, up eight places to 29th), EFTA countries and the Balkans (Serbia, up 18 places to 64th). Among advanced economies, Switzerland and the United States are the countries with the worst access to domestic and foreign markets, respectively. In addition to Singapore and Hong Kong SAR, East Asia and the Pacific’s other highest performers are Japan (16th, up five) and New Zealand (18th, down four). All countries in the region improve their score, including China (61st, up two). Among the advanced economies in the region, the Republic of Korea climbs seven notches (27th). The Mekong region exhibits particular dynamism, with all four countries improving their positioning: Thailand (63rd, up nine), Vietnam (73rd, up 14), Lao PDR (93rd, up seven), and Cambodia (98th, up four). The Middle-East and North Africa includes some top performers such as the United Arab Emirates (stable at 23rd) and Israel (up 12 places to 30th), but displays vast disparities. Like in other parts of the world, the region’s commodity-rich economies systematically underperform other countries. Despite losing three places, Chile (21st) emerges as the clear champion within Latin America and the Caribbean, leading the region in five pillars of the ETI. Mexico (up 11 places, at 51st) and Argentina (up nine, at 94th) are the most improved countries. Both Brazil (110th) and Bolivia (112th) lose 13 places, while Venezuela comes in last in the ranking. Latin America performs better than the global average on both domestic and foreign market access, but is held back by inefficient border administration and poor-quality infrastructure and transport services. Eurasia is the region that improved the least in the overall ETI, with a deterioration of performance in both market access and transport services. While Georgia further consolidates its leadership in the region, improving its score and climbing five spots to 41st, the rest of region slips. Russia drops five places to 111th. Sub-Saharan Africa is the region that most improved its performance this year, on the back of significant advances in market access (particularly foreign). Mauritius’s performance has stalled, causing the country to slip nine places to 39th (still top in the region). Liberia, following its recent accession to the World Trade Organization, is the region’s best performer, climbing eleven places to 120th. All South Asian economies have improved their ETI score over the past two years. India climbs four places to 102nd; so is Nepal (108th). Bhutan jumps 12 places to 92nd. Meanwhile, Sri Lanka (103rd), Pakistan (122nd) and Bangladesh (123rd) all slip down the ranking. South Asia remains the most closed region in the world: on average, it imposes a tariff of 16.7% on imported products (increased from 15.8% in 2014). The Enabling Trade Index assesses the extent to which economies have in place the factors facilitating the free flow of goods over borders and to their destination. These factors are organised in seven categories: Domestic market access; Foreign market access; Border administration; Transport infrastructure; Transport services; ICT infrastructure; and Operating environment. Due to changes in methodology and data availability, the 2016 results are not fully comparable with the results published in 2014. The results for 2014 were therefore re-calculated based on the new methodology.